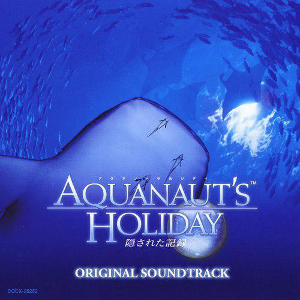 Released in 2008, Aquanaut’s Holiday: Hidden Memories is a soundtrack composed by Hideki Sakamoto that aims to impart to the listener a sense of ocean exploration. As such, it is a generally laid back score, both organic and peaceful. Does the theme of the ocean get old as the soundtrack continues? Or can Sakamoto continuously develop a fresh sound for the theme? The soundtrack opens with “Birth – Mother Ocean,” a vocal piece performed by Rie Ojima. Her smooth voice echoes undulating waves, as do the low strings, playing longer, drawn out notes in the bass. The percussion throughout maintains a very organic and subdued feel. Halfway through the track the vocals and instrumentation become more active, leading to a quick finale. The track serves as a very effective opening, with a few particularly noteworthy rising motions in the melody that are truly quite enjoyable. “Aqua Heaven” is a rather charming little piece, the main focus of which is the ukulele, performed by Yoko Sakamoto, who does a wonderful job bringing out the instrument’s technical potential. A tropical, Hawaiian feel permeates this track and it also serves as a pleasing track to initiate the album. There are a couple light hearted tracks sprinkled throughout. “Fun Chitchat” is the first of its ilk. The melody is carried by a mallet instrument with the ukulele playing quick chords as accompaniment. “With Light Footsteps” is similar, though more laid back. A flute pokes its head out and plays around melodically a bit as well. “Spring Heart” is very bouncy, with playful percussion and rather jumpy strings. All in all, these tracks are curiously reminiscent of Yasunori Mitsuda’s light hearted works (Hako no Niwa, etc); these are not quite as well developed melodically, though they do possess their own luster. The six ‘sea’ tracks are themes for different areas in the game. Each brings its own unique element to the mix, foreshadowed by each track’s particular description in the title. “Sea of Tranquility” is very much tranquil, as soft vocals play soothingly while brief motives are heard by the piano, harp and light percussion. “Sea of Investigation” is far lighter, a feeling conveyed by its pervasive usage of the flute and xylophone. The ukulele soon joins the playful mix. The piece gives off the air of rewarded curiosity. The track’s second half is quite enjoyable to listen to, as the flute and other instruments trade off the role as lead instrument between each other for brief periods, creating a surprisingly complex little movement. “Sea of Temptation” is a bit darker despite its use of steel drums. Some male vocals occasionally breathe out a surprisingly unnerving ‘Hoo!’ from time to time, as some foreboding synth lingers in the background. The track develops quite nicely as it continues, and all the participating layers of harmony pick up additional layers of complexity. “Sea of Revelation” certainly fits its title. The haunting vocals and deep, reverberating notes struck on the piano create a feeling of unearthing a secret suitably grandiose. “Sea of Whispers” is rather mysterious and somewhat unnerving. It features some rather interesting instrumentation that makes the track sound almost Middle Eastern, while still retaining its underwater feel thanks to the percussion. Finally, “Sea of Prayer” sounds as if one hit the bottom of the ocean. Making a return are the reverberating bass notes on piano, but this time the chromatic melody in the choir and almost frantic though still light movements on the strings make one’s skin crawl. Some of the tracks focusing on the piano are really quite pleasant. “Into the Profound World” is a brief little piece wherein the piano plays a simple little melody accompanied by pizzicato strings and some light synth. “Today’s Story, Tomorrow’s Hopes” is a solo piano piece whose apparent simplicity betrays its actual complex, deep melod, while. “Painful Thoughts” is thicker in emotion but not sappy. “On Her Mind” is the last of the solo piano pieces, and this one is just as melodically and emotionally thick as its brethren. It’s not quite as melodically complex, but it does feature some brief jazzy movements. “Conclusion” focuses on the guitar, but it retains a similar feel as the piano pieces. A harmonica takes over the melody halfway through, and as the percussion develops the track really starts to sound substantial, unfortunately ending a bit prematurely. There are a plethora of darker, atmospheric tracks on the album. “Hidden Memories” conveys a tense atmosphere thanks to the somewhat chromatic movements on the piano and harp that can be heard, veiled, behind a shadowy synth and heavy percussion. “Sudden Turn” retains a mysterious feel throughout, one that really can unsettle the listener, especially due some quick sliding sounds on what sounds like a guitar. “Pulsation” has a bit of a creeping feeling. The chromatic bright synth sounds sort of feel like they inch closer to the listener with every successive note. It’s a neat technique, but it feels woefully underdeveloped as the track fades. “Dread” is comprised mostly of some rather pounding percussion while a piano and strings combine to make some very unpleasant, chromatic chords. Likewise “Unification” is very ominous. Its strings and piano build up well during its unfortunately short play time. The album closes with another vocal theme, “Ballad – On an Ocean Somewhere,” sung by Kaori Nishima. The longest track on the album, this piece really serves as a rather enjoyable closing. Punctuated throughout the opening are short staccatos in the choir which are complemented quite well by the xylophone as Nishima’s soft vocals lay prominently above the whole mix. The track’s initial simplicity causes it to be rather unique, especially compared to the rather typical (but no less enjoyable) opening vocal, “Birth – Mother Ocean.” Soon a larger symphony creates a rather grandiose sound, with the mallet banging away softly throughout. Near the end there’s a brief interlude with some nice jazzy piano as well. This track almost feels melodically like it’s laying the album to rest, suiting its placement quite well. There are a few “Water – Original Scenery” tracks sprinkled throughout. While their inclusion is certainly a neat, artistic touch, it’s rather fortunate that these tracks filled solely with underwater sound effects are slight in number and short in length. A bonus track is present at the conclusion to the album, namely a remix of “Birth – Mother Ocean” by Hiroyoshi Kato. Honestly, the concept is neat, but the track really doesn’t offer much beyond a jarring electronic mix, complete with rather electronically mangled voices, as support to the original vocals. They do sort of distract from the original, and really aren’t necessary, though it’s a testament to the original song that the original melody remains just as strong. This album complements the game’s premise of underwater exploration brilliantly. I could not possibly imagine Hideki Sakamoto wrenching any more ingenious mileage out of the concept set forth from the very start of the soundtrack. Despite this, beyond their intended placement, these pieces sound a bit basic and wanting. Few of the tracks are sufficiently long to warrant appreciable development, and there is a host of filler material, not only the ‘Water – Original Scenery’ tracks but also the oftentimes jarring atmospheric tracks, which work wonderfully among their concept but are not intrinsically pleasing to listen to. This album would be hard to recommend for most, but if the reader is partial to the type of laid back, underwater, sometimes tropical style that the album represents, a better soundtrack would be hard to come by. Posted on August 1, 2012 by Marc Friedman. Last modified on January 22, 2016.